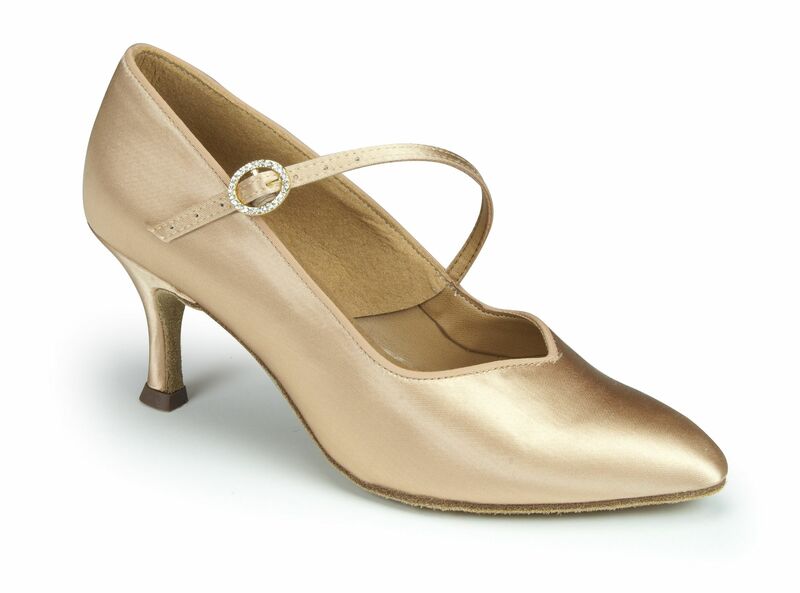 The ICS SuperStar Ballroom Shoe is a pointed toe Standard Ladies Ballroom shoe available online in Flesh Satin. This is a classic, traditionally elegant style with a strap for added stability. As you can tell by the long list of dancers below that choose to wear this design, it’s a very popular choice among the world’s finest competitive dancers. The ICS SuperStar Ballroom Shoe has a pointed toe for a more sleek design. A diagonal strap runs across the foot for added support and stability ending in an elegant diamante buckle. 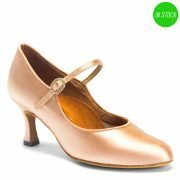 The shoe comes in Flesh Satin and is available in UK sizes 2 – 8 including half sizes and in a choice of 2 heels, the 2″ IDS or the 2.5″ IDS Heel. This is a regular fit in width. If you would like a different heel or width, please email us at info@duodance.co.uk. With International Dance shoes anything is possible and your “made to order” shoes will take just 2-3 weeks to manufacture. With Dansport and International Ballroom shoes, we recommend you order your UK shoe size plus an extra 1/2 size. So if you are a UK Size 5, order a UK size 5.5. Diagonal strap for added support and stability to the foot. Elasticated attachment to buckle for a secure fit and added comfort. Full suede sole to allow the dancer perfect grip and glide on all dance floors. International IDS Heel Protectors in Plain or Suede tips. Worn by dancers: Edita Daniute (World & Italy Professional Ballroom Champion), Kristi Boyce (UK Professional Ballroom Champion), Liis End (UK Amateur Ballroom Finalist), Margarita Zvonova (Poland Amateur Ballroom Finalist), Kayleigh Andrews (UK Junior Ballroom & Ten-Dance Champion), Charlotte Voorn (Netherlands Senior Ballroom Champion), Ella Perry (UK Juvenile Ballroom Champion).